We’re wrapping up our four part series on Nutanix AHV networking today with a look at the User VM Networking. Check out the Nutanix Connect Blog for full details. We cover the difference between managed and unmanaged networks for VMs. VM networks can be rapidly created through the Prism GUI, the Acropolis CLI, or the REST API. What I do have are some diagrams for you to look at! 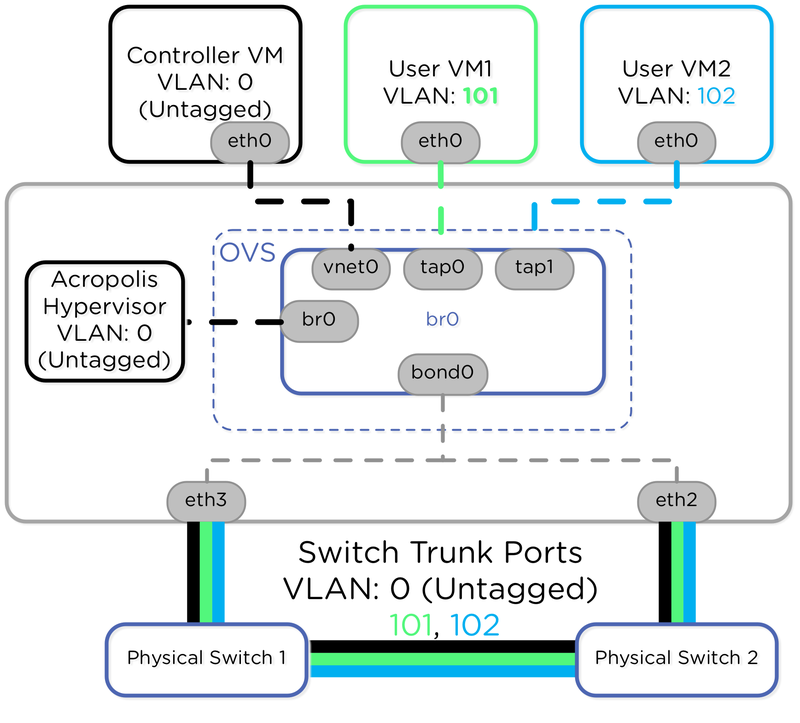 Learn more about VLANs in the Acropolis Hypervisor here on the official Nutanix NEXT Community Blog. Find complete details in the AHV Best Practice Guide. 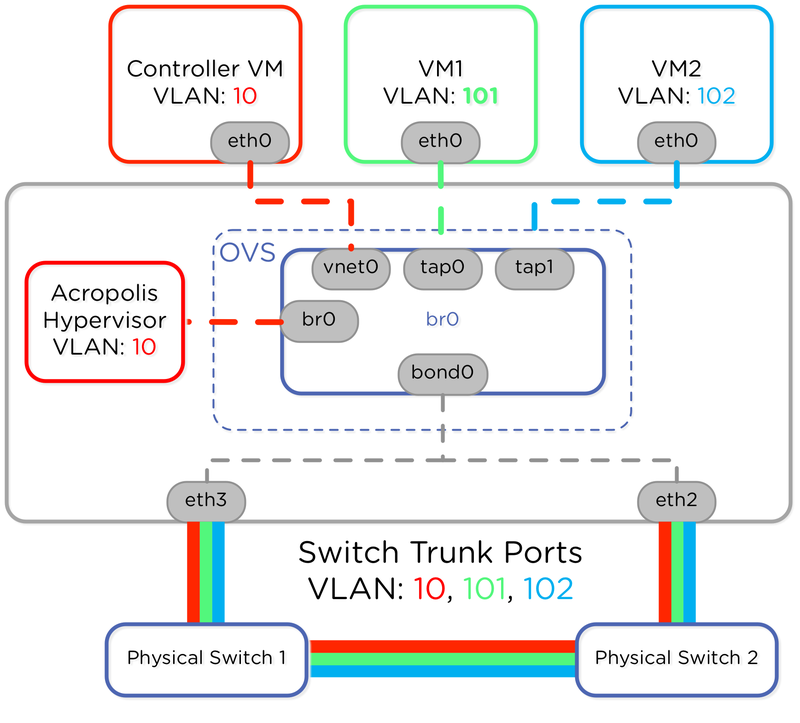 In our last post we explored bridges and bonds with AHV and Open vSwitch. Today on the Nutanix .NEXT Community Blog I’m covering load balancing within a bond to get maximum throughput from our hypervisor host! In my last blog post I talked about networking with Open vSwitch in the Nutanix hypervisor, AHV. Today I’m happy to announce the continuation of that initial post – the Nutanix AHV Best Practices Guide. Nutanix introduced the concept of AHV, based on the open source Linux KVM hypervisor. A new Nutanix node comes installed with AHV by default with no additional licensing required. It’s a full-featured virtualization solution that is ready to run VMs right out of the box. ESXi and Hyper-V are still great on Nutanix, but AHV should be seriously considered because it has a lot to offer, with all of KVMs rough edges rounded off. Part of introducing a new hypervisor is describing all of the features, and then recommending some best practices for those features. 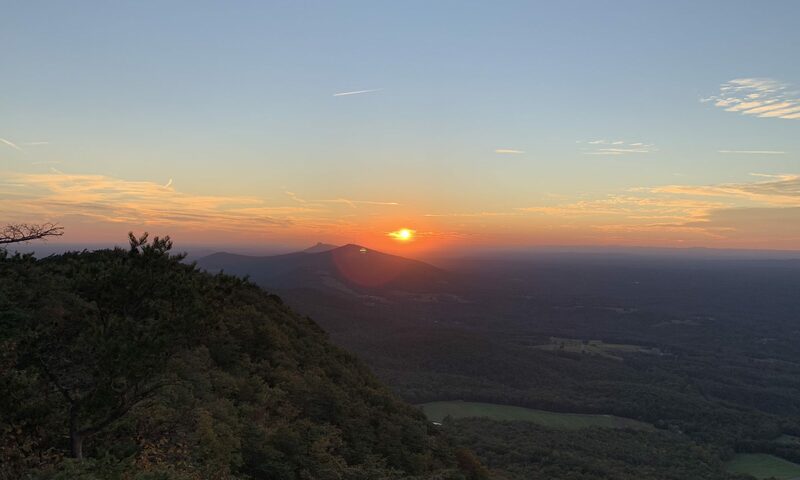 In this blog post I wanted to give you a taste of the doc with some choice snippets to show you what this Best Practice Guide and AHV are all about. Take a look at Magnus Andersson’s excellent blog post on terminology for some more detailed background on terms. Acropolis (one word) is the name of the overall project encompassing multiple hypervisors, the distributed storage fabric, and the app mobility fabric. The goal of the Acropolis project is to provide seamless invisible infrastructure whether your VMs exist in AWS, Hyper-V, ESXi, or the AHV. The sister project, Prism, provides the user interface to manage via GUI, CLI, or REST API. AHV is based on the open source KVM hypervisor, but is enhanced by all the other components of the Acropolis project. Conceptually, AHV has access to the Distributed Storage Fabric for storage, and the App Mobility Fabric powers the management plane for VM operations like scheduling, high availability, and live migration. The same familiar Nutanix architecture exists, with a network of Controller Virtual Machines providing storage access to VMs. The CVM takes direct control of the underlying disks (SSD and HDD) with PCI passthrough, and exposes these disks to AHV via iSCSI (The blue dotted VM I/O line). The management layer is spread across all Nutanix nodes in the CVMs using the same web-scale principles of the storage layer. This means that by-default, a highly available VM management layer exists. No single point of failure anymore! No additional work to setup VM management redundancy – it just works that way. Networking in AHV is provided by an Open vSwitch instance (OVS) running on each AHV host. The BPG doc has a comprehensive overview of the different components inside OVS and how they’re used. I’ll share a teaser diagram of the default network config after installation in a single AHV node. Bridges, Bonds, and Ports – oh my. What you really want to know is “How do I plug this thing into my switches, setup my VLANs, and get the best possible load balancing. You’re in luck, because the Best Practice Guide covers the most common scenarios for creating different virtual switches and configuring load balancing. 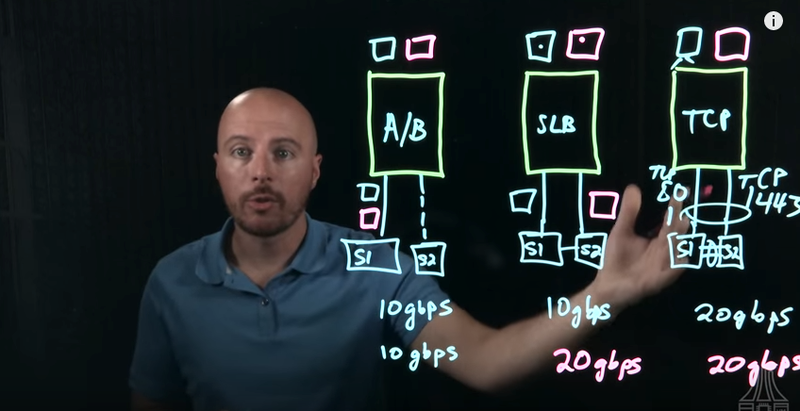 Here’s a closer look at one possible networking configuration, where the 10gigabit adapters and 1gigabit adapters have been connected into separate OVS bridges. User VM2 has the ability to connect to multiple physically separate networks with this design to allow things like virtual firewalls. After separating network traffic, the next thing is load balancing. Here’s a look at another possible load balancing method called active-slb. Not only does the BPG provide the configuration for this, but also the rationale. Maybe fault tolerance is important to you. Maybe active-active configuration with LACP is important. The BPG will cover the config and the best way to achieve your goals. For information on VLAN configuration, check out the Best Practices Guide. This BPG isn’t just networking specific. The standard features you expect from a hypervisor are all covered. Leverage the fantastic aCLI, GUI, or REST API to deploy or clone VMs. Backup up VMs with local or remote snapshots. During physical host failure, ensure that VMs are started elsewhere in the cluster. Move running VMs around in the cluster. Add the right resources to machines as needed. Rules for fitting the most VMs onto a running cluster for max efficiency. Take a look at the AHV Best Practice Guide for information on all of these features and more. With this BPG in hand you can be up and running with AHV in your datacenter and get the most out of all the new features Nutanix has added. Nutanix recently released the AHV hypervisor, which means I get a new piece of technology to learn! Before I started this blog post I had no idea how Open vSwitch worked or what KVM and QEMU were all about. Since I come from a networking background originally, I drilled down into the Open vSwitch and KVM portion of the Nutanix solution. Here’s what I learned! Remember my disclaimer – I didn’t know anything about this before I started the blog. If I’ve got something a bit wrong feel free to comment and I’m happy to update or correct. AHV is built on the Linux KVM hypervisor so I figured that’s a great place to start. I read the Nutanix Bible by Steve Poitras and saw this diagram on networking. The next place I went was routing with netstat -r to see which interfaces were used for each next hop destination. This bridge virbr0 has the vnet1 interface headed up to the internal adapter of the CVM – so THIS is where the CVM internal interface terminates. OvS has a vSwitch called br0. The CVM vnet0 is a port on this bridge, and so is bond0 (the combination of the 10GbE interfaces). We also see this special “type:internal” interface – this one with the IP address assigned to it. This is the external facing IP of the AHV / KVM hypervisor host. In addition to the CVM, external, and internal interfaces we see a tap345 interface tagged in VLAN 32. This matches the tagged interfaces from our “ifconfig -a” command above: eth2.32 and eth3.32. It’ll be used for a VM that has a network interface in VLAN 32. Finally – we come to the IP Address Management (IPAM) interfaces, br0-arp, and br-dhcp. 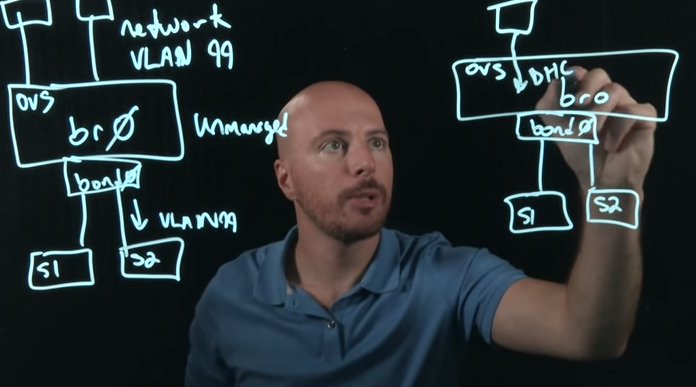 Steve mentions VXLAN and here’s where we see those concepts. The OvS can either intercept and respond to DHCP traffic, or just let it through. If we allow OvS to intercept the traffic this means Acropolis and Prism now become the point of control for giving out IP addresses to VMs that boot up. Very cool! Now let’s take a look at the config parameters passed to the running CVM. Right now this box has ONLY the CVM running on it so only one instance of qemu-kvm running. ##Here is the CVM interface going to the local link bridge. These two pieces of information tie everything together neatly for us. The internal network given to the CVM is the linux virbr0 device. The external network given to the CVM is OvS br0. Now I think I finally understand that image presented at the beginning! Since we understand the KVM/AHV host configuration lets take a look in the CVM guest. This should be a little easier. The routing table shows the internal and external networks, and just two network adapters. The eth1 adapter has a subinterface. This one is eth1:1 as opposed to .1. Not entirely sure what that one means – but I’ll keep it in mind in case I come across something later on. That’s it – just two simple interfaces in the CVM. One for internal traffic to the hypervisor directly, another for receiving any external requests from remote CVMs, the management APIs, and all of the other magic that the CVM performs! 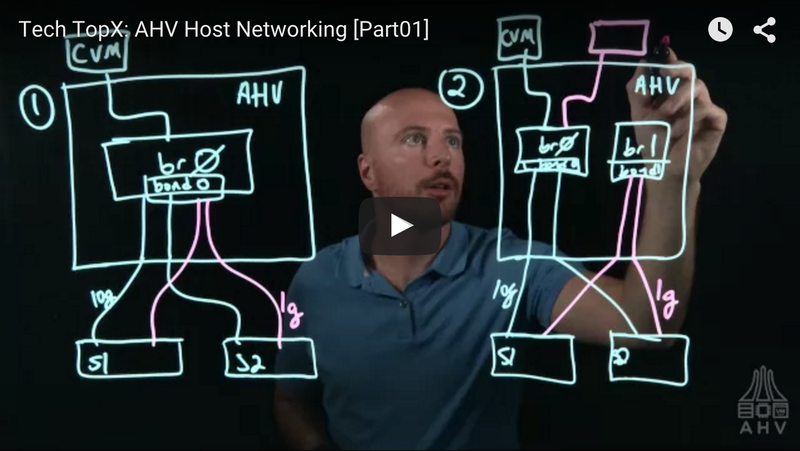 This concludes our walkthrough of networking inside a Nutanix AHV machine. I hope you learned as much as I did going through these items! Please comment or reach out to me directly if you have any questions.